Well, this is now becoming more and more of a nightmare by the day. 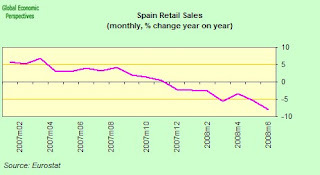 According to the national statistics office this morning, Spain's inflation adjusted retail sales were down 9.8% year on year in June. In working day adjusted terms this represented a 7.9 percent fall, making it the largest drop on record in Spain, following seven consecutive months of decline. And there is clearly worse to come, at least till we get nearer to October/November and the low base effect kicks in. We also learn today that permits issued for building new houses in Spain plummeted 57 percent over the first five months of the year when compared to the equivalent period in 2007, according to data from Spain's College of Architects. In what is only now one additional confirmation that Spain's decade-long construction boom is now well and truly over, the College said 143,918 permits were granted in the first five months of 2008, down from 336,263 in the same period of 2007. Basically Spain's economy is like a car cruising down the motorway without any oil in the engine, and one of the pistons about to seize-up. And as of the time of writing no one - in either Brussles or Madrid - seems to have the presence of mind to try to alter the course of destiny. The real point to get hold of at the present moment is that it is Spain's non-construction corporate sector which is really feeling the pain of the fact that the cash strapped banks can't help them with liquidity. Yesterday it was Iberia who had to look for a swift marriage, and today we learn that media entity Promotora de Informaciones SA (aka Grupo Prisa) - the publisher of newspaper El Pais - have just completed the sale of three buildings for 300 million euros ($467 million). The sale of the poperties to Longshore is expected to generate a capital gain of 227 million euros, the Madrid-based company said in a regulatory filing. Prisa said it will use the funds to reduce debt. Basically, in the present property market, if you are forced to sell to reduce debt, then you really are in trouble. 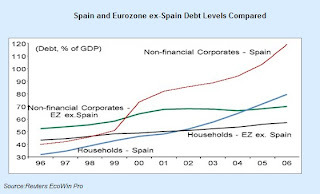 As can be seen from the chart below, the indebtedness of Spanish corporates is even more important than the indebtedness of Spanish households, and is way above the average for the other eurozone countries. "Electric vehicles are the future and the driver of the industrial revolution," Sebastian said in testimony to a congressional panel. Now frankly I don't know whether this is sheer science fiction, or a realistic policy. 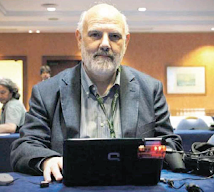 Having a million electric cars on the road would be positive (depending on how you are going to generate the electricity, and how efficient they are), but first you need one million people willing to buy them, and Spain is likely to be in the midst of a deep slump, at least during the first half of this period. So is this real, or isn't it? At this point I don't have the technical expertise to decide.